try indoor WINTER fitness FUN rebounding on a trampoline! 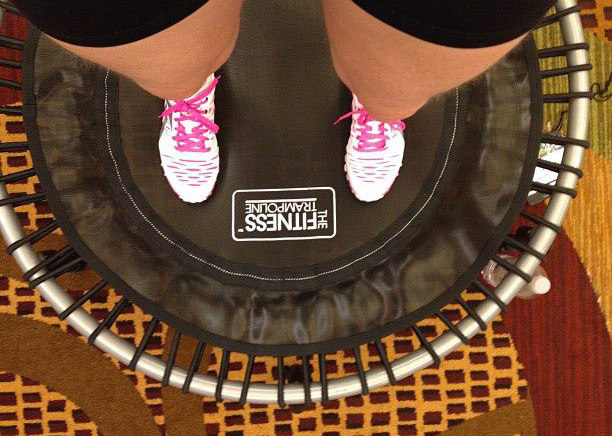 Rebounding is a great cardiovascular exercise that burns calories quickly while having fun! Why is Rebounding on a Trampoline good for your Health? It increases the capacity for breathing. It helps normalize your blood pressure. It helps prevent cardiovascular disease. It increases the activity of the red bone marrow in the production of red blood cells. It aids lymphatic circulation, as well as blood flow in the veins of the circulatory system. It stimulates the metabolism, thereby reducing the likelihood of obesity. It improves coordination throughout the body.It promotes increased muscle fiber tone. It enhances digestion and elimination processes. It allows for easier relaxation and sleep. It results in a better mental performance, with sharper learning processes. It relieves fatigue and menstrual discomfort for women. Want to buy an exercise trampoline to use at home? FitnessTrampoline.com has great exercise trampoline products for sale. We do not condone, support or promote dangerous behavior on trampolines. Please use all safety precautions while jumping.